It has been extremely wintery here in Scotland for the last few days. Earlier in the week we had six inches of snow overnight: then the next day, we had double that, followed by a storm Even the pine marten's nest was destroyed in a storm last week (luckily the pine marten is okay though, here's a video of it yesterday !). Many animals are really adapted for living in cold climates, and it doesn't get much colder than Alaska, one of the US states which is up besides Canada. 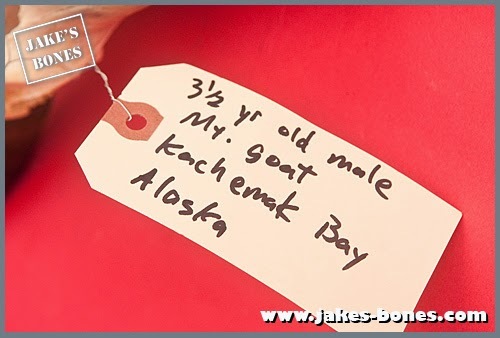 A very kind man called Mr McDonough who works for the Alaska Department of Fish and Game contacted me last summer, asking me if I was interested in any skulls from his area. 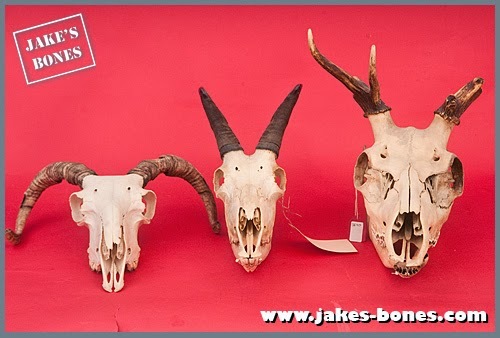 All of the skulls he suggested were amazing, like a moose and a coyote, but there were practical (and legal !) difficulties with such a big gift. 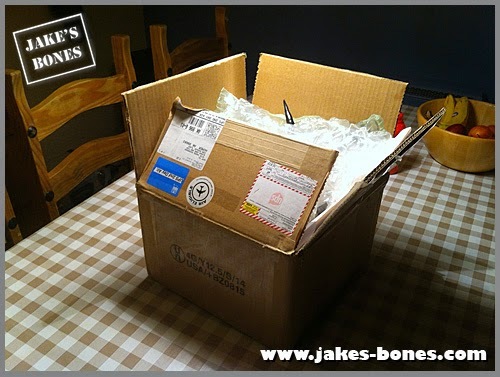 Then this box arrived - read on to see what was inside ! So what's a mountain goat ? Also I'll tell you what mountain goats are not. They are not goats. If that seems weird, you have to remember that koala bears aren't bears, flying foxes aren't foxes and polecats aren't cats. Common names are a bit misleading which is why scientists use the Latin names. Mountain goats are actually part of the antelope, gazelles and cow family. But they have a thick woollen coat because they are closely related to sheep and (proper) goats as well. They have long black horns and thick white wool for the winter. 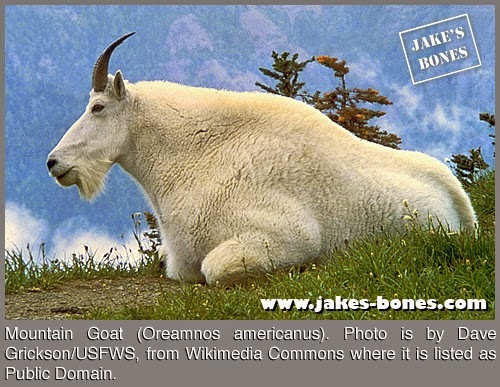 They can be found in mountains in North America and south Alaska ( that's where my goat skull came from !) There are estimated to be about 100,000 mountain goats in North America, although they are probably a bit difficult to count for obvious reasons. Their main predators are wolves, bears, cougars, and humans and they have a lifespan of about 12 years. They have hard shells on their hooves to walk up steep slopes. The females are called nannies and they spent most of their lives in herds with their kids, whereas males live in herds of two-three and they can get quite aggressive. Their mating season is from late November to early December and they usually have one kid although sometimes two, like red deer. The main problem was patches of grease in the bones. It happens with "fatty" animals such as bears, seals, and sheep, but not much with deer or foxes. During decomposition the fats gets soaked into the porous bone, and is difficult to get out. 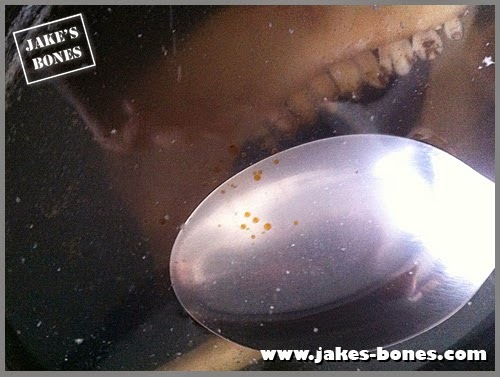 There are a few ways, but the best method that I know is simmering in plain water, which thins the fat, which can then move about the bone and float at the top of the water. I took the horns off (horns are the thin layers on the outside) then simmered for a few evenings in a slow-cooker. On the surface of the water were the brown spots of fat, which I took off with a spoon. These are before and after cleaning pictures. 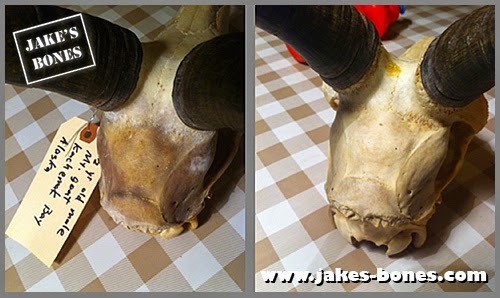 showing a bit grease spot on the end of the skull. See how new grease spots appear, though, like the one at the base of the left horn. The simmering in plain water was pretty much all I used: I think I did four simmers of that, and one with biological washing powder. I glued the two halves of the jaw together - it took two attempts, like always- and glued in the incisors and this is how it looks ! 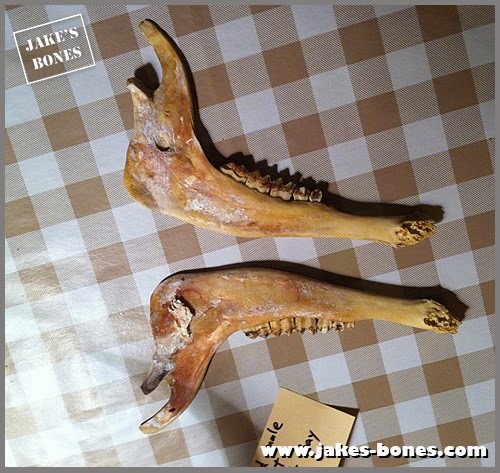 The teeth are very similar to deer, sheep and cows, with eight small "incisoform" front teeth (lower jaw only), then a gap before the six cheek teeth.The front teeth are called incisoform which means "look like incisors" because only the central six are actually incisors, and the last ones are actually tiny lower canines. 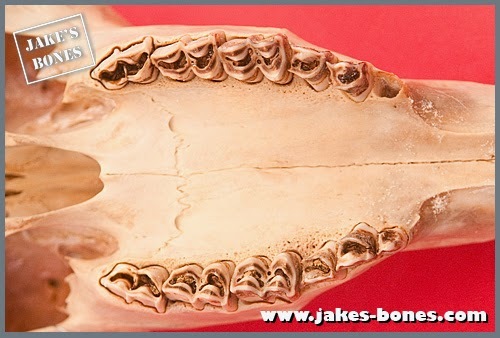 I know these types of teeth quite well, and could tell this mountain goat was an adult because all the teeth are through, but it was not old because the teeth weren't worn down. (I could have also found this out by reading the label it came with). 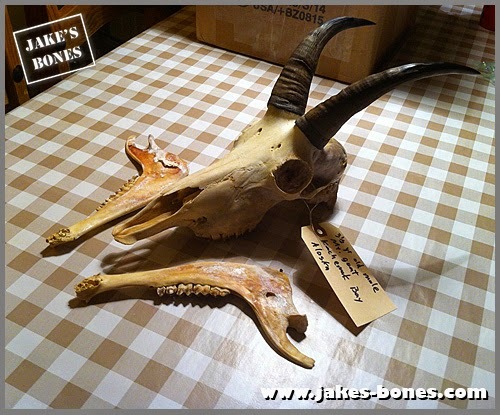 The skull is 27 cm long but quite narrow for the size.bigger than a sheep, but a bit smaller than a red deer. These are the skulls that it's next to on my shelf. As you can see it looks very similar to them both. They all have eyes on the side of their head to look out for predators and they only have bottom incisors and six cheek teeth. 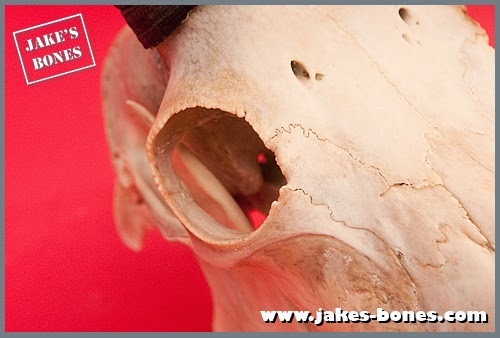 On sheep skulls, the eye sockets bulge out slightly far more than on deer skulls. 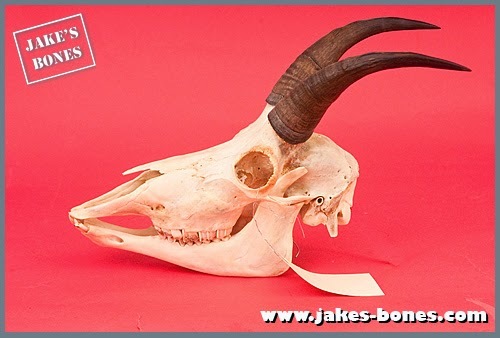 This goat has got eye sockets similar to deer, except deer have a small notch just before the eye. They have horns like sheep. 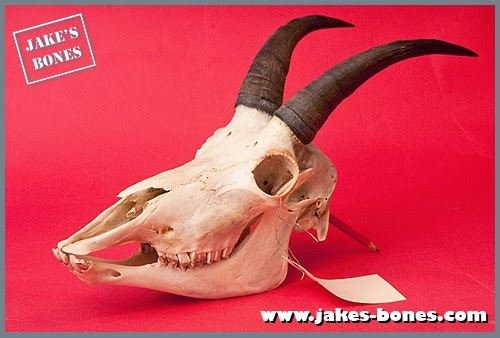 Horns are a layer of keratine - the same stuff as our hair and fingernails- over a hard bone spike, and you can take the horns off the skull to see the bone core. 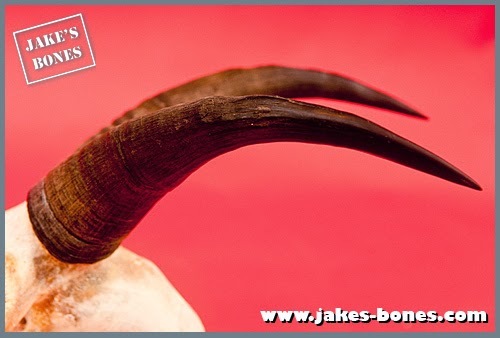 The bottom of the the horns is rougher - not as rough as in my blackface sheep, though - but the top-half is really smooth and the tip is sharp. Male mountain goats are bigger than females, and that is usually a sign that the males fight during mating season. In the mating season they fight, using their horns, for the females. I really want to thank Mr. McDonough for his kind offer and for this amazing skull ! Very interesting post. Great pics. I have a collection of 8 animal skulls myself, and I enjoy reading your blog.